We love the biscuits at Loveless Cafe. We love the dragon sculpture at Fannie Mae Dees Park. We love the cats that live at Hatch Show Print. We love the street musicians on Broadway and 2nd Avenue. We love the huge state map at Bicentennial Park. We love the great comedians you see at Zanies for bargain prices. We love the Christmas Lights at Opryland Hotel. We love the lazy river at Nashville Shores. We love date night at The Melting Pot. We love the Musica statue (even though it’s full of nekkid people). We love the gothic interior at Union Station. We love Nissan Stadium and the Tennessee Titans. We love hiking at Radnor Lake. We love chicken tenders and gold sauce at McDougal’s. We love Shakespeare in the Park every summer. We love the laser shows at Sudekum Planetarium. We love Nashville’s Nutcracker every Christmas at the Nashville Ballet. We love the big mail box backstage at the Grand Ole Opry. We love the fireworks downtown on 4th of July. We love the gardens at the Hermitage. We love the Shelby Street Pedestrian Bridge. We love Smashville with the Predators at Bridgestone Arena. We love retro rockers at The Wildhorse Saloon. We love breakfast at the Pancake Pantry. We love fajitas at SATCO. We love the Athena statue at the Parthenon. We love our little taste of Broadway at TPAC. We love pancakes and eggs at the Pfunky Griddle. We love riding the Music City Star. We love a double scoop at Mike’s Ice Cream in downtown. We love our local boys of summer, the Nashville Sounds, at First Tennessee Park. We love the sandy beach at Cook Recreation Area. We love the monthly flea market at the fairgrounds. We love Christmas trees at the Belmont Mansion. We love the snack bar at Donelson Bowl. We love the water slides at Wave Country. We love the imaginative play equipment at Cumberland Park. We love the three wheel cars at Lane Motor Museum. We love being in the same room Elvis once was on the RCA Studio B tour. We love the FREE indoor playground at Cornerstone Church. We love searching for the tombs in the Tennessee State Capitol building. We love reliving our childhood with Bo and Luke Duke at Cooter’s Place. We love learning about the stars at Dyer Observatory. We love puppet shows at the Main Nashville Library. We love the Christmas Wonderland at Jellystone Park. We love sliding on cardboard sleds down the hills at Reservoir Park. We love the Red Headed Stranger and his Willie Nelson and Friends Museum. We love the sampler platter at Pied Piper Creamery in East Nashville. We love jumping into the foam pit at Sky High Sports. We love scavenger hunts at Shelby Bottoms Nature Center. We love the carousel at the Nashville Zoo. We love eating family style and meeting new friends at Monell’s in Germantown. We love the view from the top of the Adventure Science Center. We love the food court at the Farmer’s Market. We love the first class productions at Nashville Children’s Theatre. We love dinner and a show at the Larry Keeton Theatre. We love the history of Travellers Rest Plantation. We love ice skating at Centennial Sportsplex. We love our sweet memories of Opryland USA. We love documentaries and live theatre at the Belcourt. We love cruising on the General Jackson. We love to see the American Pickers at Antique Archaeology. We love Thomas and all the trains at the Tennessee Central Railway Museum. We love touring downtown on a Segway. We love the pineapple ice cream at the Tennessee State Fair. 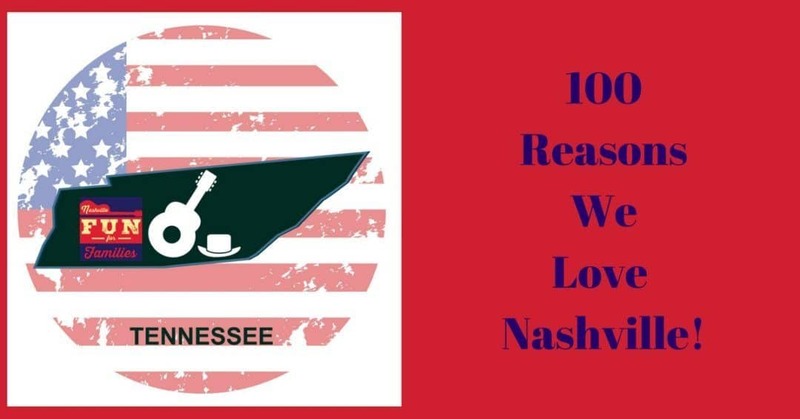 We love the songwriters at the Bluebird Cafe. We love the Artquest Gallery at the Frist Center. We love playing at Laser Quest downtown. We love Johnny Cash and his museum. We love riding the Music City Trolley. We love to canoe and kayak in the Cumberland River. We love to picnic at Edwin Warner Park. We love to explore the forest at Beaman Park Nature Center. We love the Musician’s Hall of Fame at Municipal Auditorium. We love the Ghost Ballet sculpture on the riverfront. We love the Grilled Cheeserie food truck…no matter where it is. We love honky tonks…all of them! We love indoor climbing at Climb Nashville. We love the carillons at the Bicentennial State Mall Park. We love parties at Bounce U! We love the bachelorettes pedalling taverns downtown. We love the bird sculpture at Shelby Park. We love storytime at Fairytales Bookstore. We love the Corn and Tomato statue at the Farmer’s Market. We love family bike rides at Eastside Cycles. We love the Nashville Symphony at the Schermerhorn Symphony Center. We love fried okra at Puckett’s Grocery. We love celebrating our heritage on the Redneck Comedy Bus Tour. We love a turtle latte at the Frothy Monkey Coffeehouse. We could probably come up with at least 100 more items for this list. And if we included the entire Middle Tennessee area? The list might be endless. So explore and enjoy our hometown. You won’t be sorry you did.